Last week I left you hanging, I ended the post just before Mollie gave birth. The reason behind it was that it deserved a post of its own. Also I needed to retrieve my puppy breeding notes from on top of the wardrobe, which required hubby’s help. It has been a real trip down memory lane reading through the notes from both litters. Mollie went into labour on Friday 6th October 2006. Hubby and I had both scheduled holiday for the weeks after the birth, as Mollie wasn’t actually supposed to give birth until the Sunday at the earliest. However babies the world over and of any species never turn up when they are supposed to. Mollie had been mated on 11th August, pregnancies in dogs last around 63 days and our pups were arriving on day 60, caught us all on the hop. I arrived home after my late shift at work to find Mollie calm but obviously in labour.Hubby wasn’t calm, he was panicking, thinking puppies would emerge at any moment. Mollie was panting a little and pacing a bit but nothing that anyone who didn’t know her would notice. The look of relief on her face when I walked through the door was hilarious. If dogs could talk I think she would have said “thank God you’re home!”. Hubby and I decided we would try to get some sleep that night as the textbooks had told us that she wouldn’t be delivering any puppies until at the very earliest Saturday lunchtime. How wrong we were. Mollie refused to settle and in the end I got up. There was no point in both of us being up, hubby was on an early shift so needed to sleep. I would sleep when I could and I hoped that with Mollie in the spare room, she would settle and allow me to sleep on the makeshift bed we had in there. It didn’t happen, as the hours ticked by I could see Mollie’s belly contracting, she was letting out a deep moan with each one, there was one thing I knew for sure, they were starting to get closer together. At about 2:30am having been downstairs for a bit I decided that if I didn’t want the puppies being born on the lounge floor I was going to have to convince her to come back upstairs again. Mollie didn’t need any persuading, she was stuck to me like glue, as she had been throughout the pregnancy. I felt terribly sorry for her and frightened if I am honest. I had never seen anything give birth and I was worried that something would go wrong. The stakes were high, just a few weeks earlier we had been told that Travis had 12 weeks left to live. I didn’t want to lose Mollie as well along with all the puppies. I sat down on the futon in the spare room and Mollie decided to sit on top of me. It was almost as if she had to be in my skin, as if I had to feel everything that she was going through. I couldn’t believe that it was possible but her contractions became stronger than ever, her groans louder. Then at the stroke of 3am her waters broke all over my lap. It was showtime and I was absolutely beside myself. Despite the time I called J and K for moral support. The textbooks don’t tell you that the fear you feel as active labour gets underway will leave you utterly paralysed. I have no idea what I said to them but K promised he was on his way over. I can never thank him or J enough for being there for us through everything. I really needed them and they were there. I had to wake hubby which is always difficult, I swear a bomb could go off next to him and he wouldn’t hear it. However that morning he jumped out of bed and was dressed within seconds. It seemed just a few minutes had gone by and K was here, with Mollie’s waters breaking it meant the pups were on the way. My memories of the birth are hazy, I let Karl do most of it as I was just a bag of nerves. I wish I had been more involved now but at the time we didn’t know I was going to get sick and not be able to have the litters we had been planning. Mollie’s maternal instinct seemed to kick in immediately, K helped open of the membrane sack’s that each puppy was born in. Mollie took over and did the rest by chewing through the umbilical cords and then licking the puppies clean. 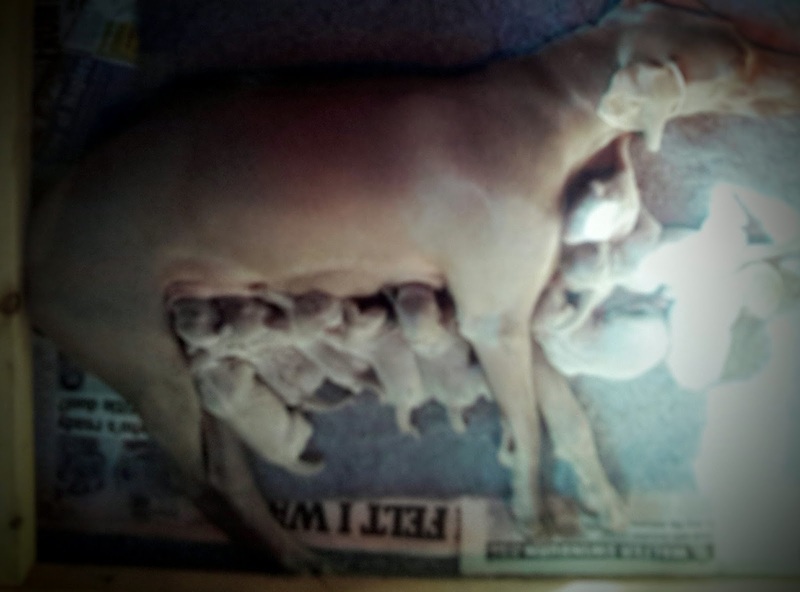 After each pup was born its placenta followed. Although opinion is divided amongst dog breeders on what should be done with the placenta we allowed Mollie to eat it. She would have done this on the wild to nourish herself and to hide the evidence of birth from predators. It was over in a flash and wasn’t that grim. You have to remember these things are natural behaviour and get over yourself if you are feeling squeamish. From what I remember puppies seem to come in pairs then Mollie would have a break for a bit and then get going again. Hubby kept out-of-the-way during the birth. He has a very weak stomach and is very squeamish, he had made it clear from the outset that he didn’t want to be involved in this part. The hardest part of the birthing process was when Hubby took Travis out for his morning walk. Mollie was completely disgusted that she wasn’t allowed out on the walk, despite the fact she still hadn’t finished giving birth. I missed the birth of the last puppy as I had to be in work at 9am so K had to do that one alone, not that I had actually been much help, more a shocked observer. To give K a break his wife J came over and sat with the puppies until I came back from work a few hours later for my lunch break. I was utterly exhausted but walking on air. By the time I got to bed that evening I hadn’t slept since the Thursday night. I really wish that I had kept more detailed records with the first litter, only because I have no clue as to where Frankie was born in the litter but do with Willow. 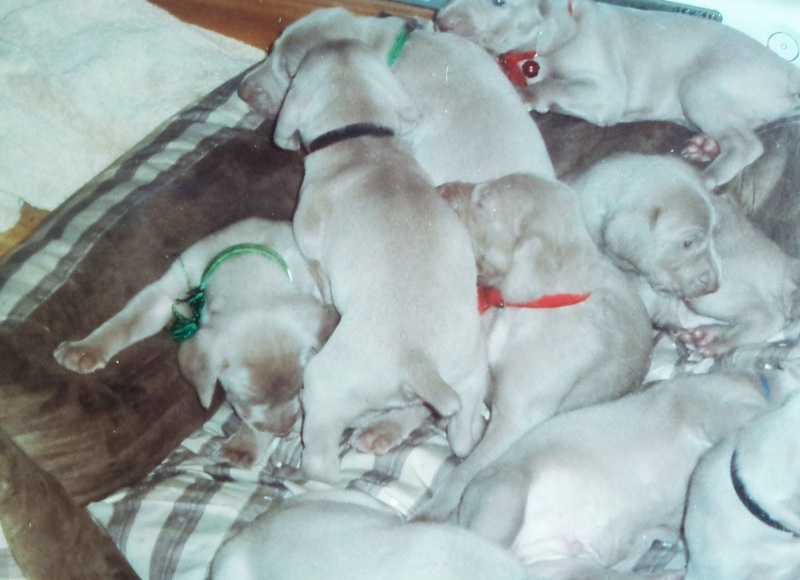 My second litter was ridiculously monitored, I know exactly which pup was which, where they were born in the litter and what they weighed at birth. The first litter was weighed later that day but I didn’t have anyway of properly distinguishing between them when they were born. It wasn’t until later when I needed to keep a record that I managed to find some way of telling them apart. It was a bittersweet moment today when reading through the puppy papers that we discovered that we had used Travis’ name as one of the pups names. I think due to all the stress and emotion that we suffered with him passing and then me getting sick that we just forgot completely that we had used his name. I am glad we did, it’s nice to know that somewhere his name lives on. My first litter records are incomplete. I have no clue where Tiffosi Travis ended up, By the time they were a few weeks old we had them in different coloured cat colours and all my records refer to the collar colour. I never wrote down anywhere or if I did it’s lost in the house somewhere, which pup had which Kennel Club name. I am kicking myself now.I could do some digging to find out but I am happy just knowing that Tiffosi Travis is out there. 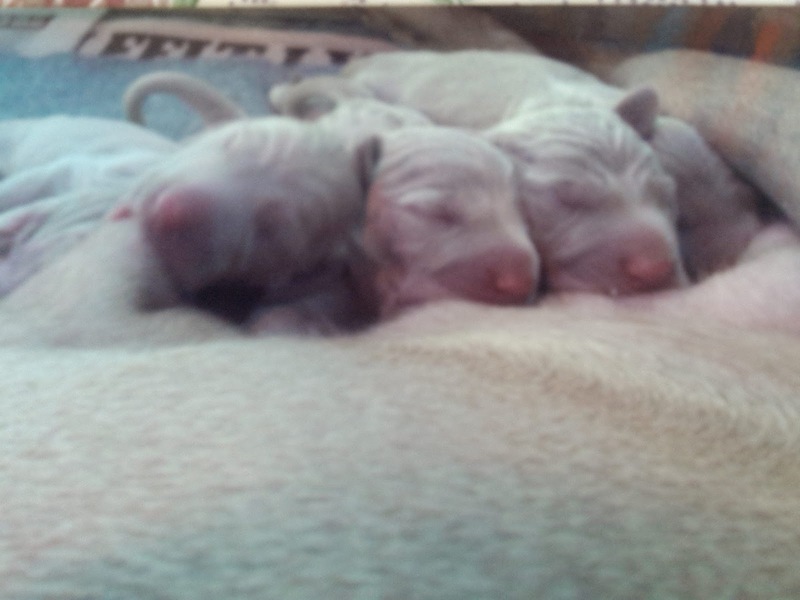 As you can see all the Puppies apart from Willow were named after Grand prix related things. 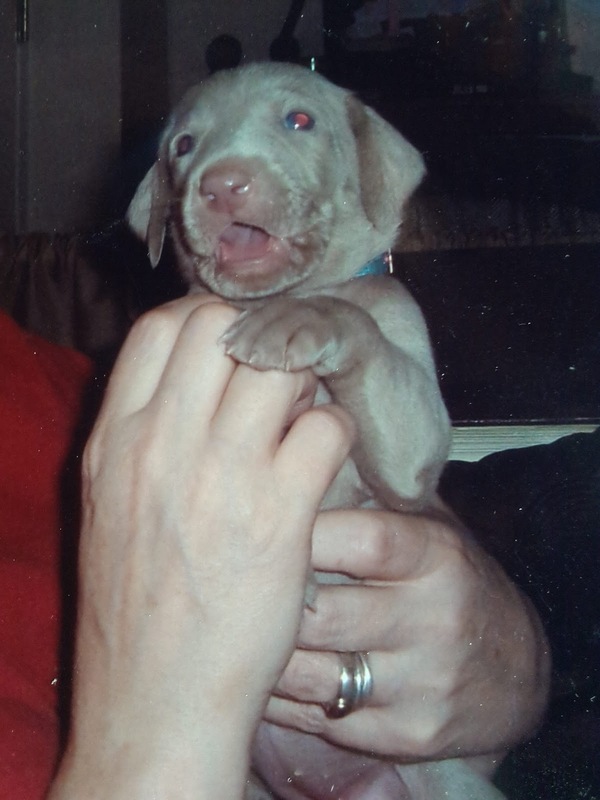 The Kennel Club made an error with Frankie’s pedigree name as it should have been Monte Carlo Baby not Monte Cario Baby at the time though I just couldn’t be bothered to correct it. It had been hard enough coming up with 18 names as each pup has to be supplied with two names, so that they can check to ensure no other dogs have the same name. 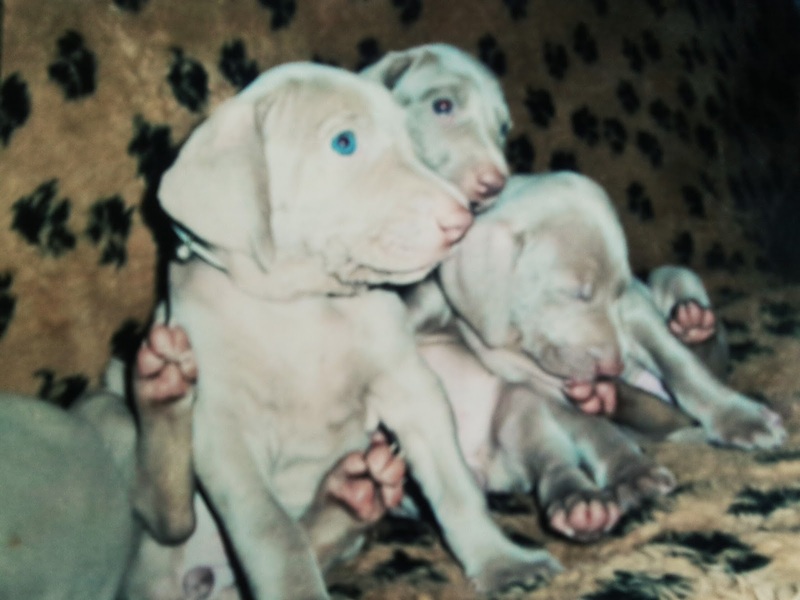 Weimaraner puppies are born with tiger stripes, as you can see in the picture below. The pups are around 24 hours old in the picture, over the course of a few days the tiger stripes fade. Willow was known as stripey initially as her stripes were so prominent and took a few weeks to fade. Puppies suckling Mollie, puppies are 24 hours old with the tiger stripes fully visible. 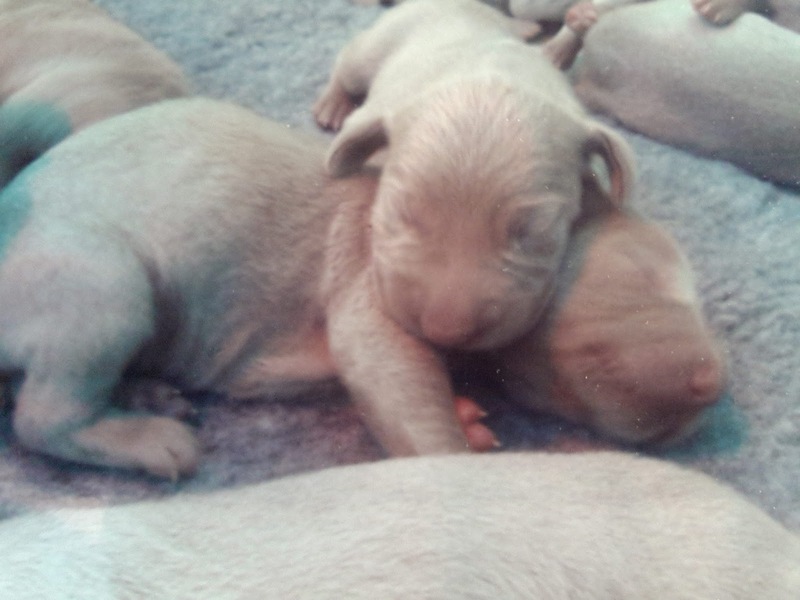 Puppies are born with their eyes closed and they do not start to open until they are 10 days old. As they open they are all black, it is very freaky when all the pups turn and look at you. Hubby and I jokingly referred to them as Demon eyes as they looked like something out of a horror film. Gradually over the space of a few days the eyes start to turn a bright blue. 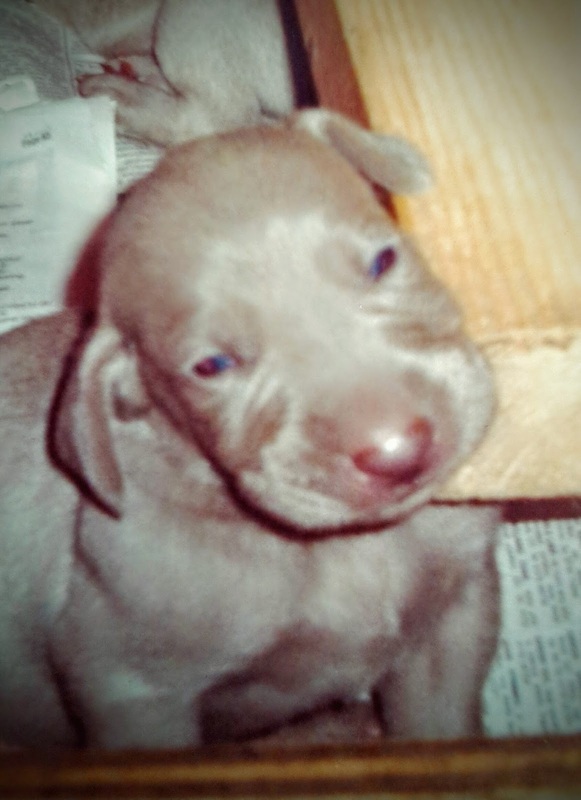 Eventually as they grow up Weimaraner’s eyes turn into a more amber or green colour. 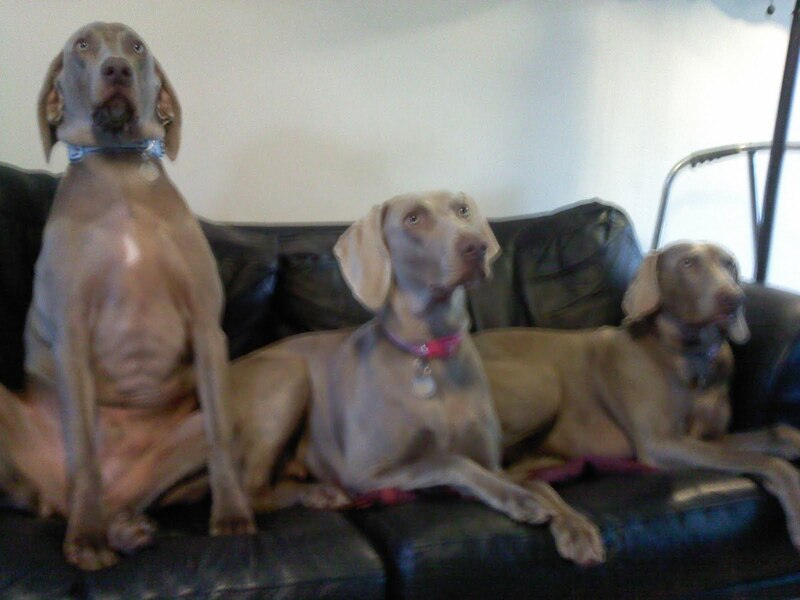 Very occasionally they stay the brilliant blue colour they had as puppies. Puppies around 24 hours old. Initially the puppies were quite easy to look after, they didn’t move around much, spending their time eating and sleeping. The whelping box had to be cleaned 4 times a day, disinfected, with the newspaper and vet bed completely striped out. 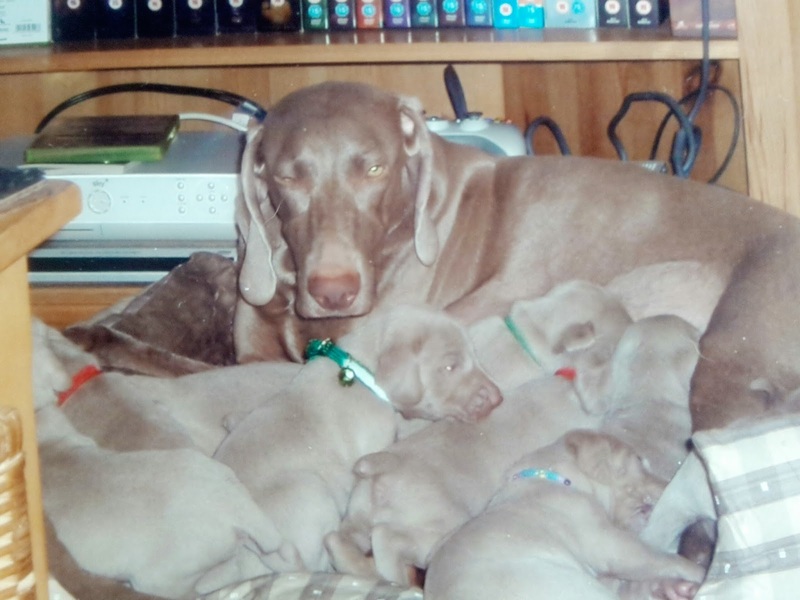 Mollie was producing milk but not enough to adequately feed 9 large puppies so we had to start supplementing her milk. To help ease the pressure on Mollie, I fed the pups every 4 hours day and night. Bottle feeding them was an absolute joy, hard work but it brought me much closer to them and I got to pick up on their individual characters. However by the end of two weeks when their eyes were open it was clear that they were ready to move onto more than just milk. I made them up a puppy porridge, I whizzed up puppy food in the food processor so it resembled a fine dust and mixed it with the puppy milk. It went down a storm but feeding time was incredibly messy. With pups standing / lying in the food. Every time they were fed they had to be washed off and then dried because they were covered from nose to tail. I had to do this 4 times a day. Hubby helped when he was home but mainly I was responsible for the puppies. 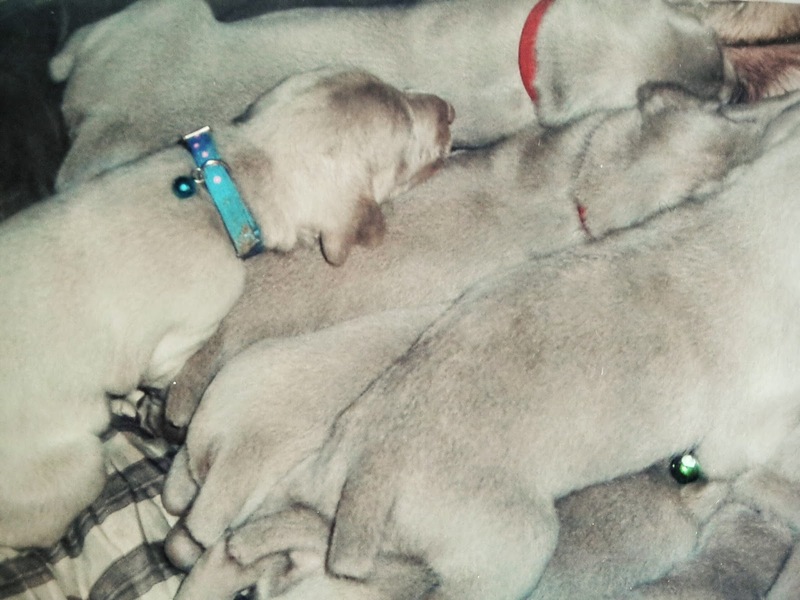 A litter of puppies becomes incredibly hard work from week 3 onwards. From week three they are incredibly mobile and getting into everything. It is like having 9 boisterous toddlers in the house that you are attempting to toilet train. Puppies like babies have no respect for sleep or the fact normal life continues whilst you are raising them. For some reason the puppies seemed to think 2am was a perfectly reasonable time to get up and have a play. Under our bed seemed to be a favourite spot and the amount of things they chewed / damaged was phenomenal. The boy with the pink nose chewing the side of the whelping box. Aged over 10 days old as you can see the eyes are open and are changing from black to the brilliant blue. People ask me if I was sad when the puppies left us to go to their new homes. 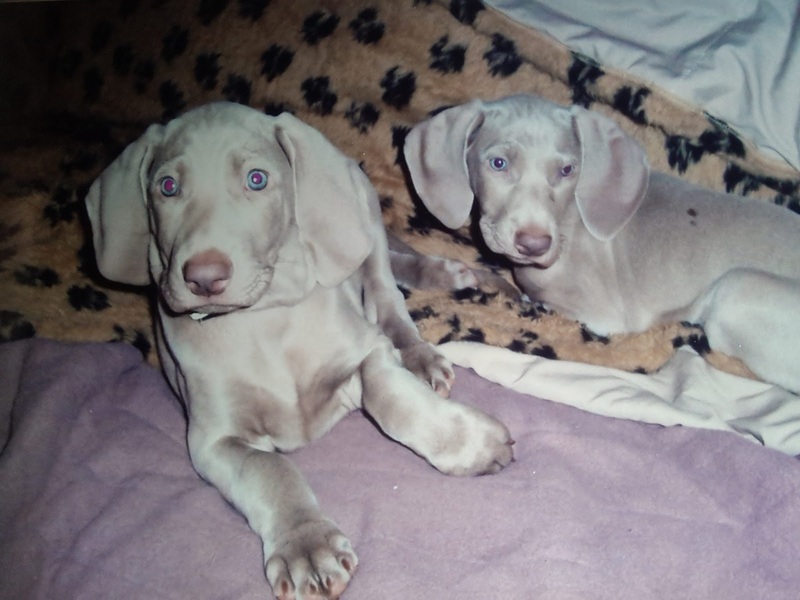 I always laugh, by the time they were ready to leave us at 8 weeks old I was exhausted. One of the hardest things about rearing puppies is finding homes for them. People mess you about, they arrange appointments to come to see them only to never turn up and you never hear from them again. That happened to us all one Sunday, we had four appointments booked and only one person turned up. 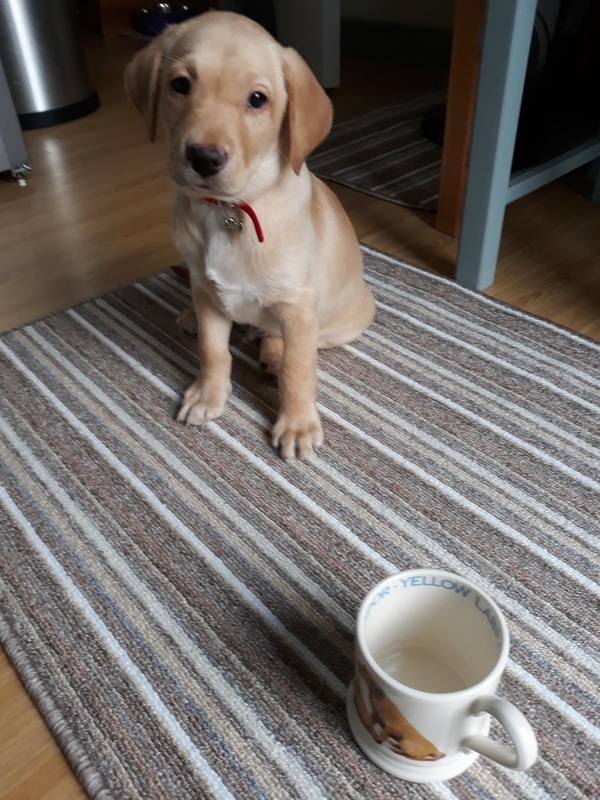 It becomes soul destroying when on your day off you’ve got up, raced around making the place look like it hasn’t been chewed to pieces, that the pups are toileted and fed, only to sit for hours waiting for people who have no intention of turning up. Lack of manners really winds me up, it was even worse with the second litter. It was so stressful that was one of the reasons why we didn’t breed again. Puppies aged between 4-6 weeks, this is when people started to view them. On the whole though when the puppies found new homes and I could see the excitement in people’s eyes when they took their puppy to the car made it all worth while. The pups always left us with toys, a grubby tea towel (so they had something in their new home that smelt of them), food, puppy pads (although most of our pups were pretty much house trained by the time they left), a pedigree document and a massive booklet I had put together giving them info on when the pups were wormed, what with and how much food to feed them. I also gave them handy hints and tips on getting their pup settled. My phone number was also included should they ever need any advice or had any concerns. The puppies were still feeding from Mollie at this time and were slowly being weaned. The hardest part when all the puppies have gone is the silence. All our pups had cat collars with bells on, so we had become very used to the constant tinkling of bells. It was eerily quiet and after all the frenetic activity of the 8 weeks prior, to suddenly sit back and have no puppies running around, getting under your feet is just weird. It was one of the most rewarding experiences of my life but it was also incredibly hard. After the second litter I knew it would be impossible for us to continue as I was just too sick to cope with puppies and then finding them new homes. I am really pleased that we did it and given half the chance would do it all over again. 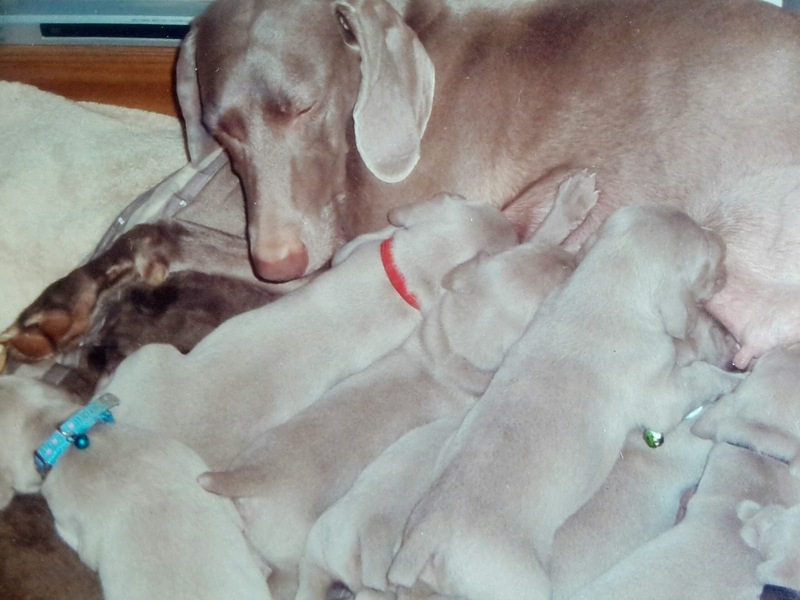 A tired Mollie feeding 9 hungry puppies.